The battle for supremacy in the upper-ranges of the executive segment is no better encapsulated by the long-standing tussle Mercedes-Benz and BMW have going with the E-Class and 5 Series. The likes of Audi and Lexus, even Infiniti may beg to differ, but they are very much left-field choices and rank outsiders in what is – and always has been – a two-horse race. It’s a scrap of immense proportions, this, even if the scale by sales isn’t tremendously large in the overall scope of things, more so of late with dilution as a result of new segments. It’s about bragging rights, really. While much of the focus and current fashion is scoped at the mosh pit that involves the C-Class / 3 Series, they aren’t quite full-fledged executive offerings in the corporate, being-driven in vein, or a symbol that shows to the world that one has truly arrived. The S-Class / 7 Series of course is, and as the showcase is unarguable, but the luxury-class duo is perhaps a bit too stratospheric in terms of reach – or arguably a bit too opulent and showy – for many. Which is why the middle ground is very much where the real fight for one-upmanship is. The current W212 Mercedes-Benz E-Class has been a good workhorse throughout its life cycle, but – like the F10 5er – is showing its age, especially with newer models from the brand showing it up in terms of flash. Much promise with the W213 E-Class on paper, but how does the tenth-gen measure up in the metal? We head to Portugal to find out. The original W212 was many things, but an outright looker it was not, at least to this writer’s eyes. Nonetheless, it was at least integrated. The facelift – which arrived on the scene in December 2012 – looked disjointed, the car’s new softer-looking front not quite blending in with the angular rear, and it didn’t matter how many times it was viewed. Attraction, as they say, is a straight-up thing. The W213, which sits on the brand’s modular MRA platform first used on the W205 C-Class, offers a far less edgier depiction. 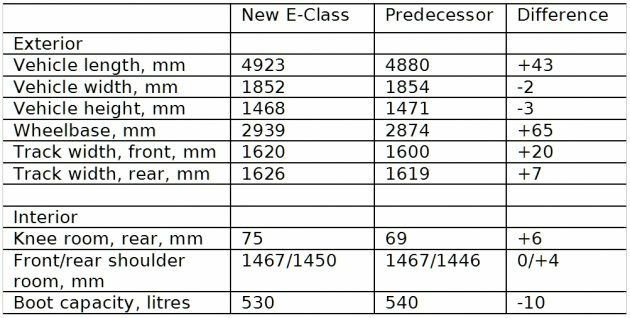 The new body, which utilises a higher usage of aluminium (+11%) and ultra-high-strength sheet steel (+3%) than its predecessor, isn’t short of curves, and the shape is good enough to have a drag coefficient value of 0.23, a record-breaking figure for the segment, so it goes. Flow aside, there’s no escaping the inevitable comparison that it does look like an upscaled C-Class (or smaller S, if you will), but the proportions look far better resolved and complete on the larger canvas the car – which made its debut in January at Detroit – has at its disposal. Longer, slightly narrower and marginally lower than its predecessor (we’ll leave it to the dimensions table to show the differences), the result is a much more elegant-looking offering than its predecessor, more so in the metal. However you choose to view it, you surely can’t call it slabbed or a shapeless three-box. As is the case elsewhere, the exterior is distinguished by elements, most discernible from the front. There’s a Basic (or taxi) version, which wears a classic Mercedes radiator grille with the star on the bonnet, and this is also applied on the Exclusive line variant, though in more elaborate fashion. The Avantgarde and AMG Line models, meanwhile, are identifiable by the sports radiator grille with a large three-pointed star as its centrepiece. The E-Class variants with a bonnet-mounted star feature an Airpanel front-grille shutter system, similar to that seen on the latest C-Class. The system opens the radiator grille by means of adjustable louvres when extra cooling is required and also features a second shutter in the air intake beneath the number plate to further improve the system’s overall performance. Like with the C-Class, H7 halogen-equipped headlamps are standard fit items, moving on to static High Performance and second-generation Multibeam LED units (now equipped with 84 individually activated high-performance LEDs, up from 24) as the specs increase. At the rear, the car is dressed in a single-piece tail light with a two-bar design, similar to that on the C-Class (the current S-Class has a three-bar design). All equipment lines come with a two-part rear bumper and visible stainless steel tailpipe trims integrated into the bumper, save the Basic line offering. New to the mix is an optional “stardust effect” rear lighting system, created with the use of crystal optics in the reflectors and a specially-configured surface structure. Described by the company rather fancily as a “highlight reminiscent of stardust, the Milky Way or the glow of a jet engine,” there’s no denying that there’s plenty of glitter in the new lamps when viewed up close, especially uncovered. Standard fit wheel choices are a chunky-looking 10-spoke alloy on the entry-level Basic, a five-spoke design for the Avantgarde and a five twin-spoke for the Exclusive, and the AMG Line gets an AMG five twin-spoke unit. As for paint choices, the palette count is 12, made up of two solid, seven metallic and three designo shades. Neat work, the exterior, but the real deal with this one is when you step inside. The cabin is lavish, and while some of the design cues have been seen before, it’s neatly mixed, the styling of the front-end horizontal bias layout, straddling a good middle-ground in between the new C and older S, tipping towards the latter with the structuring of its instrument panel. On higher-end variants, the panel consists of two 12.3-inch display screens with a resolution of 1,920 x 720 pixels merged to form a single instrument cluster, with a common glass cover giving it a seamless, flat-screen look. Drivers can choose between three different styles – Classic, Sport and Progressive – to select a preferred screen design for the wide-screen cluster. Brilliant piece of kit, but that’s very much a cost option, and a more common sight will see a conventional layout consisting of two tube-type round dials and a seven-inch colour display cluster (1,000 x 600 pixel resolution) and an 8.3-inch, 960 x 540 pixel central display screen residing within the space. New seats find their way on, differently designed depending on the line (Exclusive, Avantgarde and AMG Line), and a diamond-patterned designo seat with perforations – similar to the S-Class seat – can even be specified as part of an optional designo interior, if the idea of replicating that look is just the thing. At the back, a new three-piece 40/20/40 split rear backrest replaces the 60/40 configuration in its predecessor, and options include a holder for a mobile tablet device. Options abound, from seat comfort package and climatised units to an active multi-contour seat pack, and there’s even a new Heat Comfort package, which introduces heated armrests in the doors and centre console, though it’s a very safe guess to say the latter won’t be seen in local cars. On goes the latest-gen COMAND Online system, which offers Apple CarPlay and Android Auto integration, and as for audio system choices, these start from an Audio 20 with a seven-speaker, four channel-amp configuration. A mid-line 13-speaker, nine-channel Burmester surround sound system is a step up, and there’s also a new Burmester high-end 3D surround sound system, which brings the speaker count to a whopping 23.
dial/touchpad pod controller, familiar from the C-Class, is also present. There’s also Near Field Communication (NFC) connectivity, which can double up a suitable smartphone as a digital vehicle key, as explained in our earlier video on it taken during the international media drive of the car in Lisbon. Also on, a wireless, inductive charging system that works with all mobile devices that either support the Qi standard or that can be upgraded to the standard. The charging pad, built into the stowage facility at the front of the centre console, is compatible with mobile phones with a screen up to six inches in size diagonally. At its point of launch, the automaker announced two engines variants for the car – one petrol (E 200) and one diesel (E 220 d). In Lisbon, the E 200 was nowhere to be seen, the test fleet consisting of E 300 and E 400 4Matic petrol and E 220 d and E 350 d oil burners, with the E 350 e Hybrid also making a working appearance. Nonetheless, Malaysian buyers will definitely be seeing the E 200, which features the familiar M 274 DE 20 AL 2.0 litre four-cylinder turbo petrol engine, the unit continuing on with its 181 hp (184 PS) and 300 Nm output seen in other applications in the Merc model line-up. Performance figures include a 0-100 km/h time of 7.7 seconds and a fuel consumption figure of 5.9 litres per 100 km. The same mill also equips the E 300, in a higher output tune of 241 hp (245 PS) and 370 Nm, identical numbers to that seen on the C 300 sedan and recently-introduced C205 coupe. Here, it’s good enough to haul the W213 to the century mark from standstill in 6.3 seconds, with a 6.6 litres per 100 km consumption being claimed. Though there was no mention of it in available literature both at launch and the drive (which was in March), it’s almost certain that the petrol engine line-up – which tops off with the 3.0 litre V6 E 400 4Matic variant – will see the introduction of an E 250 variant at some point to complete the usual trinity of output tunes available for the M274. The variant as well as the E 300 will be part of the local line-up, but no word on whether the E 400 4Matic or oil burners will. Speaking of oil burners, a quick aside on the OM 654 DE 20 LA, a new 2.0 litre variable geometry turbo-four offering 191 hp (194 PS) and 400 Nm, and which powers the E 220 d to the 100 km/h mark from zero in 7.3 seconds. The unit effectively replaces the by-now-familiar 2.1 litre OM 651 turbodiesel as seen in the W212 E 300 BlueTEC Hybrid, though it remains to be seen if it will get here given the permutation of the new hybrid’s powertrain. As standard, all E-Class variants (save the baseline version) come equipped with the automaker’s new 9G-Tronic torque converter automatic transmission, and all engines available for the car are equipped with an ECO start/stop function. Like the C-Class, the W213 is equipped with a fixed steel suspension system as standard, with three types of selective damping set-ups to be found. There are two Agility Control systems, one being a comfort suspension and the other a comfort suspension lowered by 15 mm for the Avantgarde. The third set-up wears a Dynamic Body Control tag, and this adds on a new sports suspension with adaptive damping to replace the previous fixed sports suspension. It too lowers the ride by 15 mm. Available as an option is a multi-chamber, all-around air suspension. Known by its moniker Air Body Control, the automaker says it’s a class-exclusive option, seeing as how its competitors have previously only offered air suspension at the rear axle only. As with that seen on the C-Class, the ABC system features self-levelling capabilities and maintains optimal ride height, comfort and sportiness based on prevailing road and driving characteristics, though chassis-specific programmes can be chosen manually via a Dynamic Select button, with Comfort, Eco, Sport and Sport+ modes to pick from. A customisable Individual mode rounds off the list. The real push with this one isn’t just with the interior and associated gizmos in the cabin, but also with the blinding number of driver-assist technologies that are available for it. Some are nascent, while others are an evolution, but there’s no doubting that it’s thoroughly comprehensive, the attempt to stuff as many things as possible on. The more pertinent question is just how many of these will make it on to the local-spec cars. Standard fit items include Attention Assist, Crosswind Assist and Active Brake Assist, but the showcase piece is the optional Drive Pilot, the brand’s semi-autonomous driving system grouped within the extended Driving Assistance package. Working together with Distance Pilot Distronic, the system is able to keep the car a correct distance behind vehicles in front automatically up to speeds of 210 km/h for the first time. The Distronic itself features a restart function in stop & go traffic. Also integrated into Drive Pilot is a radar and camera-based Active Lane-change Assistant, Active Emergency Stop Assist, a cross-traffic function to Active Parking Assist and Evasive Steering Assist, the latter assisting drivers who perform sudden evasive and corrective manoeuvres by providing optimal steering torque to support the movement of the wheel. Also present, Active Lane Keeping Assist and Active Blind Spot Assist. Fresh bits include an updated Pre-Safe Plus, which gets new Impulse side and Sound capabilities. Pre-Safe Impulse side allows the W213 to move its driver or front passenger away danger zones once an imminent side impact is detected. The system inflates an air chamber in the side bolster of the front seat backrest nearest to the side of the impact, creating a greater distance between the impact and the occupant. As for Pre-Safe Sound, it’s a system meant to reduce stress on vehicle occupants in a collision, at least audibly. Based on the human reflex in the inner ear called the stapedius reflex, the system functions by emitting a short interference signal through the vehicle’s sound system if the risk of a collision is detected. This signal can trigger the natural reflex and thus prepare the occupants’ ears for the expected sound of the accident. The barrage of new tech is completed with a new Parking Pilot system with Remote Parking Pilot, a smartphone control-based parking feature as well as the series production adaptation of Car-to-X communication. The latter works via mobile phone-supported exchange of information with other vehicles further ahead on the road, allowing drivers to be warned of say, broken down vehicles or sudden adverse weather conditions. In the case of Remote Parking Pilot, the simple reasoning behind this feature is to prevent drivers from having to squeeze themselves out or in to a car that’s parked in a tight spot, or when garage parking is limited in width. Like that seen on the G11/12 BMW 7 Series, drivers will be able to call on the E-Class to enter or exit a parking space, all accomplished remotely via a mobile app. That really is quite a staggering list, and as you’d expect, everything was on show in Portugal, either through a dedicated on-site presentation or plonked on the test mules, which in the case of our example was an E 300 variant. Although our market will be primarily shaped by the E 200 and E 250, the model nonetheless offered a good approximation of what to expect down the line. One of which is not the ride, not in outright terms anyway. As is the fashion these days to impress through wares, the Avantgarde trim unit – finished in a striking designo Hyacinth Red metallic exterior and machiatto beige/black interior – was loaded to the gills, Air Body Control suspension included. Actually, no surprise with the last, because it’s standard fit on the variant, and so the report card on the regular sprung suspension will have to wait till we can get our hands on the local cars. The air suspension, like that on the C-Class, works beautifully for the most part. In Comfort mode and at low to mid-speeds in an urban environment, ride is plush, the ABC soaking up the challenges and peculiarities thrown up by surface along the initial route without skipping a beat (or in this case, hitting a thud), with excellent secondary ride characteristics. That composure carries into cruising and higher speed levels, though like that on its smaller W205 sibling, certain road imperfections can cause amplitude issues with the primary ride, with the same floaty, distended sensation coming across. The effects are marginal though, certainly more transient than that on the C-Class, and taken as a whole, the ABC here scores high marks for its compliance and overall poise. The refinement is aided largely by the notable in-cabin quietness, brought about by reduced levels of wind noise. At highway speeds, the isolation in this regard is first-rate, with the sonic returns from the extensive aero-acoustics development work being audibly evident; the interior is well insulated from disruptive frequencies, the most perceptible source of any noise bleed being the sunroof, and even then, not overly intrusive. The powertrain/drivetrain pairing continue the equation. Nothing to nitpick with the M274, which is very much a familiar quantity; in its highest state of tune, the unit drives the E-Class along capably, and the car doesn’t feel short of speed, even if that’s not the main focus here. As for the new 9G-Tronic transmission, it’s a marked improvement over its seven-ratio sibling in terms of transitional behaviour and, most importantly, speed, though it is still very much geared for smoothness than effervescence. That gentle linearity is most noticeable on initial take-up, which is a little laid-back but very much in tune with the scope of the car. Switching over to Sport mode and Sport+ progressively improves response, though it also introduces a level of coarseness to the damping of the primary ride; still, it’s supple enough to serve all but the most delicate rear. Firm but not jarring across almost all of the working surfaces of the route, I found Sport appealing enough to leave it engaged for much of the extra-urban part of the drive, and my co-driver – who wasn’t a motoring journalist – also found the particular setting very workable. The steering is light and works a charm in city use, but the typical Mercedes feel is again evident; there’s not much to speak about, and the more adventurous drive modes simply add on resistive heft rather than substance. Handling aspects are competent, the car tidy, if not very remarkable, traversing twistier terrain; Munich’s advantage in outright athleticism remains, even with the old guard F10 on watch. Still, it didn’t stop the automaker from attempting to highlight that the new E-Class’ can play when pressed, with a bout of lead-follow stomping on Estoril (yes, the track) in the E 400 4Matic. The flagship petrol variant did very well chasing about on the course. Yes, there’s still an underlying softness evident, but on the whole the car drove cleanly and tracked surprisingly well on the bumpy circuit. The presentation was efficient than ebullient though. It is this constant, noticeable even on a racetrack, that highlights how the new E-Class’s character can best be summed up – composed, predictable and comfortable, perfect descriptors in line with its premium executive sedan leanings. Luxurious too. The cabin is really the highlight of the whole W213 affair, from the visual kaleidoscope conjured up by the new widescreen instrument panel to the tactility of materials dressing up the entire space, both from a touch and sight perspective. It really is outstanding in this regard. The new front seats are a boon, and there’s good spatial perception where the rear bench is concerned, though legroom gains aren’t all that great (as the photo above shows) despite the increased wheelbase dimensions. It’s not even a case of the boot being larger – in volumetric terms, it’s actually down by 10 litres over the old car. There’s no sacrifice to scope and usable space though, at least not perceptibly upon initial inspection. Elsewhere, marks too for the new steering wheel touch-pad buttons, which, once you get the hang of it, allows easier movement in between functions and feature selection. If anything, they show up the somewhat fussy, cumbersome nature of the COMAND dial/touchpad pod controller that bit more. Even though we’re not going to see them here, a quick mention of some of the more novel technologies on call. The semi-autonomous elements of Drive Pilot are alluring from an operational point of view, working through the cruise and lane change tasks asked of it on open Portuguese highways very cleanly, but I can imagine it will take a bit more use before one puts unquestioning faith in the system. The Remote Parking Pilot is another. In Lisbon, the demonstration retrieved a W213 out of a makeshift garage via a mobile device loaded with the Mercedes me connect application, later reparking the car in, accomplishing both nose in and nose out perpendicular parking exercises without a hitch along the way. So comprehensive was the examination of tech that there was even a chance to explore the workings of the new Multibeam LED lamps in real-world conditions; the drive on the first day extended well into dusk, allowing the lighting array to showcase its illumination aspects, the light distribution – as well as fill – and adaptive qualities (to incoming cars, reaction to traffic sign reflectivity) being particularly impressive. Like with the W205 C-Class, it’s easy to see the direction Mercedes-Benz has taken with this one – re-envision its classic executive sedan with more visual presence, refine the delivery and up the levels of premium and luxury. Smoother and plusher than ever before, the new E-Class looks and feels the part. Throw in the barrel of technologies and it’s as much revolution as it is evolution. The new G30 BMW 5er isn’t very far away, and its arrival promises that the long-going rivalry will gain fresh impetus. Until it appears though, the argument is well and truly settled as to which sits at the top of the pack. rm280K Audi A6 much better packaged & priced. Nevertheless, not bad effort, Merc. But Volvo is the benchmark for best seats, comfort, and new interior feels very premium. Some reviews complaint some of W213’s plastic just feels cheap and hard. Not something one would expect in this class. That said, very well done on NVH refinement. But also very expensive. In UK, where market is more open minded, this doesn’t make it automatically a winner. Especially new Volvo S90/V90 just launched, it’ll be the one to look out for. I think it will do well here, the uncles will rejoice when they see the interior. The rest will wait for the G30 from Munich and I personally want to have a look at the S90 in its EEV CKD form as it holds a lot of promise (pricing too) although most will shy away from it due to its RV as some have pointed out. Go mudah, search year 2012 S60 T4/T5, C200/C250, and 320i/325i. Volvo still commands rm99k the lowest after 4 years, while those Germans already in rm80k++ range. Considering Volvo usually priced cheaper when new, tell me who’s actually better RV here? People want RV, just stick to Honda Civic, hilux or godcar vios. Everything else no RV, deal with it. You got read the line before? They’re 2012 cars, 4 years old. Yes, Mercedes C200, back then RM250k+- brand new, today already depreciate to under RM90k. Go mudah, and believe it yourself. So much for Merc got high RV. what are you smoking? Went to Mudah.com , not a single C200 2012 model is price 80k Plus. Stop talking rubbish when you can’t back it up. Sorry to tell you, Merc and BMW command a different class. Volvo is known as the BMW and Mercedes rejects. fantastic car…but i think the volvo s90 is better than this. But S90 is a FWD car. And the rear of S90 is boxy not nice. So the new E does not have much interior space/boot space and some of it are made from cheap plastic and it rides decently into the corners. On the positive side, interior looks plush and rolls over bumps like a cloud (with ABC sussy). Will wait for paultan to test the stock suspension on our potholed ridden roads before making a judgement. Otherwise well done MB, hope BMW buckles up and make a decent interior for its upcoming 5er since it’s not always about ‘the drive’. Hope MBM launches the diesel here though, the new engine is regarded to be very eager and smooth. Merc E350 cost Us$53,000. CBU Pure German Made. V6 that churns out 320bhp. Come to Malaysia, become RM1 million. How to bersyukur like this? Get a Volvo, the tongsan are generous and honest. They’ll give 5+5 years warranty and on-call service. Best peace of mind after sales service. When tongsan get EEV, they really pass savings to consumers, like new XC90 just got rm50k discount. Germans mostly penipu scammer. Tipu emission, tipu DSG, tipu EEV, pretend give high discount, but actually old price marked up kaw2. Instead of solve issue, they give free sweets, free petrol, car wash leleleleeeeel. The design is so uninspiring, after seeing so many S and C class on the road. I expect alot more from the E, which typically had its own identity in terms of design. I wonder there is a “traditional” air-panel front?